DALBAR is a leading research firm who for 21 years have been researching investor behaviour through their annual Quantitative Analysis of Investor Behavior study measuring the effects of investor decisions to buy, sell and switch into and out of mutual funds over both short and long-term time frames. What follows is evidence that investors can be their own worst enemy and they should fear themselves more than any economic crisis or market correction. Investors tend to do the opposite of what works in investing. We have all always intuitively known that investors tend to buy at the tops and sell at the bottoms. And now, after more than 20 years of reporting on investor behaviour, that observation can be confirmed as fact. Today, in Australia, investors are mortgaging themselves to the hilt to chase ever-increasing prices for real estate. This, even though record credit card and mortgage debt suggest they can least afford it, and private debt is at record highs. But relief is in sight because it is not the case that record prices and record supply can coexist. In the stock market, investors have herded themselves into a corner chasing yield and making the most expensive companies those that distribute the most in dividends… but retain the least for growth. Historically low interest rates have also ensured that the Weighted Cost of Capital (WACC) calculation has rendered companies with the most debt, the most expensive. Historically low interest rates have corrupted investors understanding of risk ensuring they accept bond-like returns or even lower-than-bond-like returns, but take on equity or property market risk. Once again this concoction has never ended well. Meanwhile, thanks to the faddish behaviour of large institutional investors who found themselves underweight banks and resources right at the moment Trump was elected and iron ore prices started to surge, midcap high-quality and high-growth companies have been sold off – many, as much as 50 percent. The selloff was instigated by large institutional managers that required cash to fund a move back towards market weights in the banks and resource companies. If there is one criticism, commonly levelled at the quality and value philosophy we are proponents of, it is that quality is easy to identify and rarely cheap. Well, here we are with companies like Healthscope and REA Group down as much as 30 percent in just a few weeks. What this Whitepaper highlights is that investors rarely see an opportunity for what it really is. In preparation for 2017 and beyond – which will be interesting (expect bond rates to continue climbing) – this Montgomery Whitepaper seeks to arm you with knowledge of yourself and the real impact of your decision making, ruled as it is by emotion. Over the very long term, it has been shown that equities provide the highest return for investors, and yet most investors are not reaping the full benefit of these returns. “Perhaps the most compelling evidence that investor behaviour leads to poor decision-making is the end result,” DALBAR said. 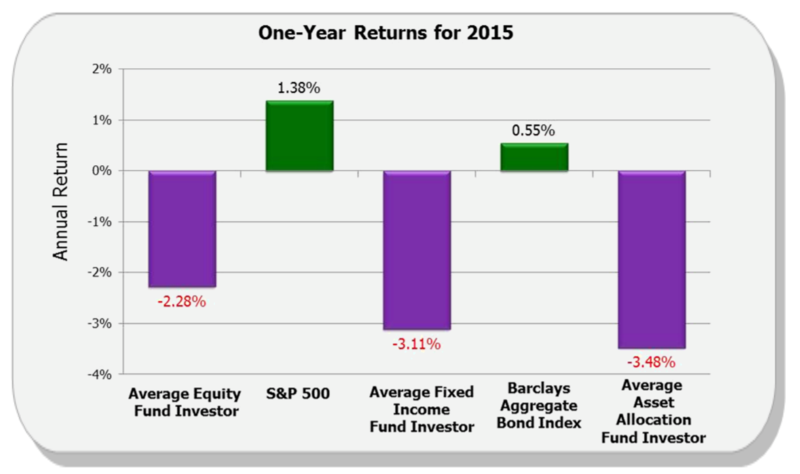 In 2015, the average equity mutual fund investor underperformed the S&P 500 by a margin of 3.66 per cent. The difference between the average fund investor and the overall market was the difference between making money and losing money. As the chart below illustrates, while the broader market made incremental gains of 1.38 percent, the average equity investor suffered a more-than-incremental loss of -2.28 per cent. 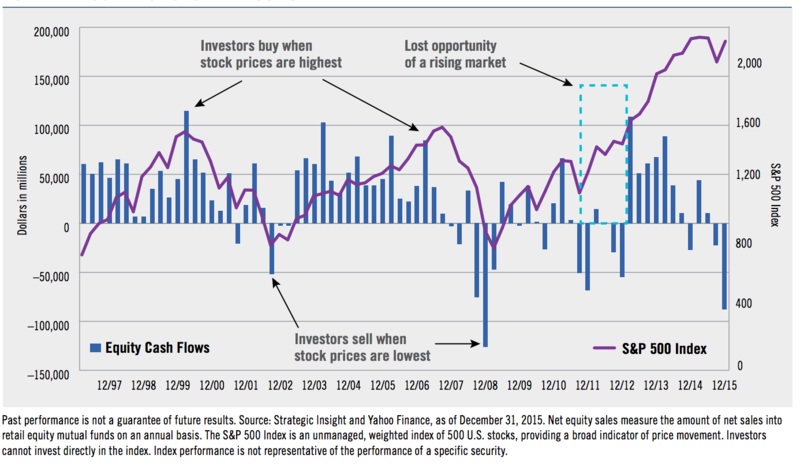 The average investor has always lagged the overall market as illustrated below. Why is this? By any measure, equity returns have far outstripped those from bonds and property in almost every country around the globe over the very long term. Every investor wants to buy low and sell high, but most investors do exactly the opposite because investment decisions are often driven by emotion. Investors get excited when the market’s rising and everyone else is buying. And of course the flip side, they panic and sell when the market is trending down. This behaviour leads to poor outcomes. Investors who try to time the market and invariably get it “badly” wrong, baling out under stress during downturns and piling in when market strength makes them optimistic as the chart below demonstrates. According to DALBAR’s QAIB “Investors may only have themselves to blame, investors make poor investment choices that hurt their investment returns. 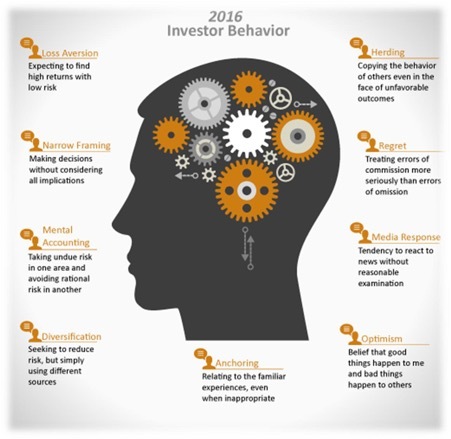 There are nine distinct behaviours that tend to plague investors based on their personal experiences and unique personalities. Loss Aversion – expecting to find high returns with low risk. Herding – copying the behaviour of others even in the face of unfavourable outcomes. Narrow Framing – making decisions without considering all the implications. Regret – treating errors of commission more seriously than errors of omission. Mental Accounting – taking undue risk in one area and avoiding rational risk in another. Media Response – tendency to react to news without reasonable examination. Diversification – seeking to reduce risk, but simply using different sources. Anchoring – relating to the familiar experiences, even when inappropriate. Optimism – belief that good things happen to me and bad things happen to others. You can see these behaviours in an infographic below. “Conventional financial theory suggests that investors are rational and seek to maximise their wealth through objective, non-emotional investment decisions. That makes sense. Nobody invests with the goal of losing money. However, the emotions of fear and greed, along with herd instinct, have long been thought to be the main drivers of markets and investor behaviour and lead to irrational investment decisions. This thinking has given rise to the field of behavioural finance. “We saw the regret and pride response in action beginning in March 2000, the largest purchase of mutual funds in the history of the stock market. Fast forward to 2008, just before the “Great Recession” market downturn, and stock prices were falling, but investors refused to sell at a loss. As the market continued to fall, investors held off until they simply couldn’t take it any longer. Many sold their stock near the bottom and missed the following upswing that began around March 2009. “What many investors may not realise is just how difficult it is to then make up that loss. For example, a 50 percent loss would require a 100 percent gain just to break even — a concept known as negative compounding. “Investing your own money is a very difficult thing to do. To properly invest, you need to emotionally detach yourself from your money. This is more than many investors are capable of doing. One thing that all the negative behaviours have in common is that they can lead investors to deviate from a sound investment strategy that was narrowly tailored towards their goals, risk tolerance and time horizon. Finally, it is worth considering how profitable it can be by ignoring all of the market’s vicissitudes over nearly 100 years. That’s what I wrote in my book Value.able, published in 2010. Since then, however, the dividends have kept on flowing – there have been another 14 in fact – and there was a two-for-one split on 13 August 2012, as well. By March of 2015, after 14 further dividends and the two-for-one split, and since 8 January 2010, the value of that single Coca-Cola share in 1919 is $11.7 million. The point is that there has been plenty recently to frighten any ‘investor.’ There’s been QE tapering and fears of inflation, deflation and reflation. We’ve witnessed the Russian incursions into Ukraine, uprisings in Egypt and Europe, a shadow banking crisis and property collapses in China and the threatened annexation by China of disputed territories claimed by Japan, Vietnam and the Philippines. It’s enough to see investors put their cash under the mattress. And yet, through it all, sound companies with powerful competitive advantages, keep growing their net worth and throwing off rising levels of income. We trust this paper has convinced you that your own actions may contribute to poor long-term returns. Uncertainties tend to cause us to lose sight of the long-term and focus on the immediate. We swap the telescope for a microscope, and our returns tend to suffer. Ben Graham, the intellectual dean of value investing said investors should approach investing the way they might buy groceries; buy more when the item is on sale. It seems investors do the opposite of what they need to do to succeed. It also seems investors try and do too much. As the Coca-Cola example shows, picking a great stock or a great manager and doing nothing more, can potentially be a very profitable exercise. Conversely, as DALBAR has proven, too much activity is counterproductive. So if you are feeling nervous, rest assured you are never alone. But don’t join everyone else in jumping from one boat to another or jumping at shadows. Read "Advisor Perspectives-A Simple Explanation for DALBAR's Misleading Results". Of course the short answer for us to be safe is to invest with Montgomery. Instead of the example of Coco Cola,which seems to approve long term investments,there are equally almost infinite examples where this advice would be a disaster. The article refers to"the universe of all mutual fund investors whose actions and financial results are restated to represent a single investor." Seems statistically to be taken with a bag of salt. Why is this relevant in Australia fro SMSF investors,for example?